The Burlap Bed Skirt was just as Pictured. My Bedroom is old world decor so it matched perfect. The shipping was very fast! I would recommend! This is a unique bedskirt. 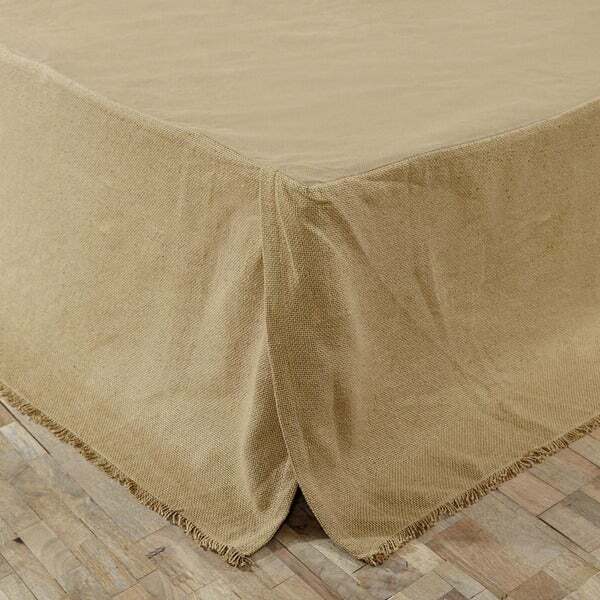 I have a bit of a glam bedroom so I thought I would add some earthiness by adding this bedskirt. It really looks nice and gave me the look I was going for. The fabric feels like soft burlap and has a slight metallic thread throughout. Bedskirts are a pain to put on a box spring, but with this one, it has stayed in place. This has a deep drop, so it dusts my floor, which I like. From time to time I use my handheld vacuum brush to clean it. So, easy care! Before placing on the bed I lightly ironed the bed skirt and It hasn't wrinkled The fringe looks good and hasn't frayed. This is well made. It would look great IMO with any decor from glam to rustic. This fits my king size bed well. it is very simple and works well with a farmhouse vibe. The color is true to a burlap color. Overall I'm very happy with the product. I just don't give 5 stars unless it exceeds my expectations. I needed this bed skirt for my spare room that has a masculine feel to it. The package arrived promptly and in good condition. The burlap was reasonable quality and the pictures on the website are an accurate representation of the product I received. I would prefer it to be about 3 inches shorter so it doesn’t pool on the ground so much. Just the rustic finish I needed for the bed! Just as depicted. Really nice weight and falls well Pleased with quality and price. Purchased this for my queen bed at ski cabin for high use and can stand up to multiple dog house.... so far so good, looks good and sturdy.! I love everything about this product. It matched the bedding perfect and fit the bed perfect also. The fabric is great. Perfect for the style I was going for. Nice quality. Looks just like the picture . I absolutely love these bedskirts. They finish off my farmhouse guestroom perfectly. I got the exact look I wanted without making the room too “girly”. Get them, you will love them. Just the style of bed skirt I needed to match my bedroom furniture. Very cheap fabric and doesn't have any structure so just hangs there. I cannot recommend. Love the look of this bed skirt....very rustic! Perfect for my guestroom. Love! "How do you wash this burlap 100% cotton bedskirt and do you it looks like you have pillow cases in this material to match. Do you have blankets in this natural material? Thank you."